The first craft I got into was crocheting. I wouldn't call it a hobby, not doing it for fun, but just when there was a need. I do make the baby blankets for my niece and nephews when they are born, and only one other thing. I REFUSE to buy a dishcloth, so I make mine. I love the thick feel of yarn ones, and they are so much better for really scrubbing a counter or stovetop. 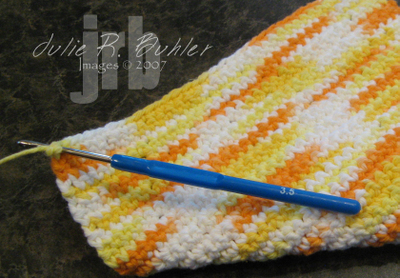 I have used all different kinds of stitches, but the one I like best is just the single crochet . I like my cloth to be tight, and not have to many holes in it. This dishcloth was made using 1 whole ball of 1.5 oz. cotton yarn. I made my beginning chain 36 long and then added 2 more for starting the single stitch on the next row. Then I keep going until there is not enough yarn left for another row and tie it off. And another non-stamping related picture (don't mind the flower pot...hehehe). Is this not the neatest flower ever?? Ugly, but neat! Click on it for a larger view. I got this weird-looking plant from my Grandma before she passed and she called it a leopard cactus. You can kinda see the plant in the top left corner. When the the flower starts, it looks almost like a little ball, and unfols to stay for about a week. Then it folds back into it's ball before drying up and falling off. I will never get rid of this plant, since it came from my Grandma. The bonus - to start a new plant, you just break of a couple "branches" and put them in dirt. They take off in a hurry, and only require water once every 2 weeks! Hope you have a great day, and I'll try to get a card on here too!! ETA : I found a link you can visit for the flower, for the name and more pictures. It is actually called a Toad Cactus, or Starfish Cactus (orbea variegata). It is a really neat plant, and in warmer climates, can be outside.